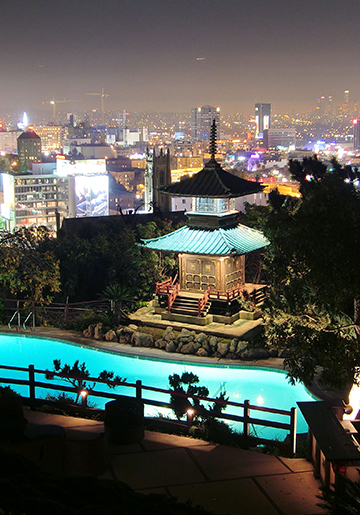 Cheerful Events: I Love L.A.! 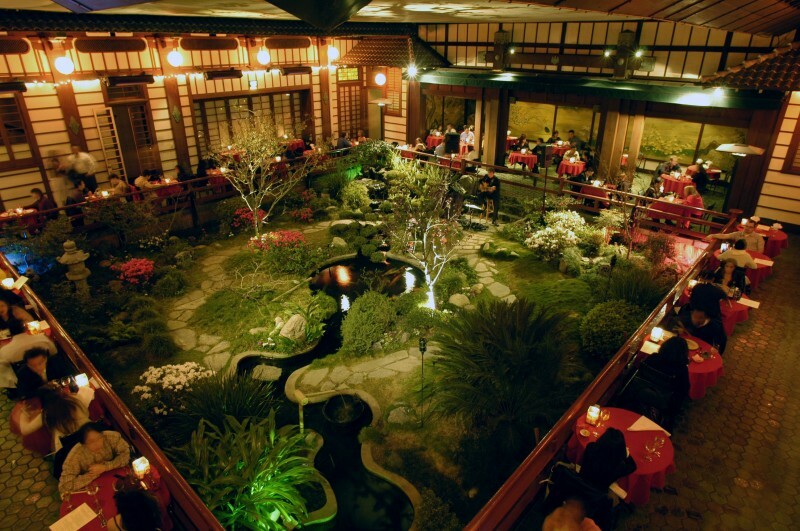 Last night Becky and I went out to eat at this beautiful Japanese restaurant, Yamishiro, that sits high on a hill in Hollywood. We sat looking out at this incredible view while we had a cocktail and ate some dinner. What was left of the stress from the drive up to Hollywood melted away and I felt very happy to be there enjoying that special moment with my lovely daughter. I had driven to Hollywood to watch Becky's improv show at IO. I left the house at 4:50 and barely squeaked in a couple of minutes after the show had started at 7:30. Traffic stinks!!! When I left the house I had envisioned arriving about a half an hour early and unwinding and relaxing while enjoying a glass of wine in the bar that is the entryway to the theater. A perfect introduction to a comedy show. Instead I self consciously crept in riddled with tension and a grumpy inner voice I had to quell that was grumbling "just try to make me laugh, suckers!" Pretty much exactly the kind of audience member I envision all comedians want to perform for. In spite of my irritable inner child, I did enjoy the show very much and had a wonderful time afterwards. Turns out my fussy inner child settles down very nicely when given a nice white wine "bobby", a pretty city view "mobile", and a darling little playmate to talk to. Definitely worth the hassle to be part of the fun and enjoy time with Becky. Fortunately coming home the roads were wide open and I got back in about 45 minutes. Next time I go up by myself I will leave even earlier and plan on finding a nice coffee house to hang out in for a bit. 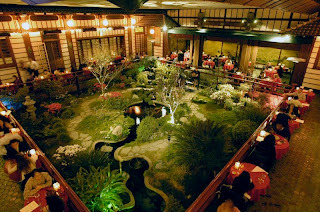 We loved this very pretty koi pond room at the restaurant. We took a moment to decide if we wanted to eat in here, it is so cute, but in the end the beautiful city view won out. That view is amazing! Sounds like a fun night!